Keltruck celebrates the 20th anniversary of trading this year. The company was started by Chris Kelly (Chairman) back in 1983 with 20 employees. Today Keltruck has ten depots around the West Midlands, Staffordshire, Gloucestershire, Warwickshire & Worcestershire & employs over 270 people. The Directors are inviting all Keltruck staff to celebrate this milestone occasion by holding a dinner dance on Saturday 7th June 2003 at the Platinum suite, West Bromwich Albion Football Club from 19:00 to midnight. Dress is optional dinner jacket or lounge suit. Please ensure responses are returned to Sandra Haney by Thursday 1st May. 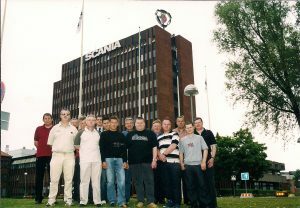 In addition, nine technical staff (all with ten or more years service) are being taken on a trip to Sweden to visit the factory in Södertälje at the beginning of June. The trip will be hosted by Chris Kelly & John Biggin (Managing Director) accompanied by David Johnson (representative from Scania Great Britain). New sales have started well with orders of 172 & leading market share of 21% against Volvo with 19% & Daf 17%. Used have sold an impressive 92 & going strong… We will have none left at this rate! We held a 5-a-side football tournament on the evening on Monday 17th February in Cannock. Two teams from the Accident Repair Centre, one from sales & one from customers Alutrade & John Lomas Removals fought it out in a tight league. Alutrade were runners up with overall winners John Lomas taking the trophy (so as a PR exercise it could not have been any better!) Well done to Jake Fallon for organizing the event & to all the Keltruck teams who represented the company very well indeed. Thanks for the ‘curry’ Mike, watch this space for the re-match! Congratulations to Boyd Talbot who has won the Sandwell College Advanced Modern Apprentice of the year in Motor Bodies studies. This is the second time that a Keltruck Accident Repair Centre member of staff has won this prestigious award; Grant Lawley won the award in 1999. Well done. Congratulations to Jon England, our Cheltenham 3rd year apprentice, who has won the Scania Apprentice of the Year award. Tony Tomsett (General Manager Technical & Logistics, Scania Great Britain) said “it was a pretty tough decision this year as the calibre of the lads was so high so congratulations to Jon”. The Cheltenham depot team welcomes Stephanie Hill (Parts Van Driver), Andy Button (Lateshift Technician) & Paul Seal (Dayshift Technician). Congratulations to Chris Watkins whose wife is expecting their baby in October! Congratulations to John Schofield, our youngest apprentice, on passing his car driving test! Thanks to the staff at Droitwich & Cheltenham. It has been hard work over the last quarter due to staffing problems, so thanks to everyone for their efforts. Congratulations to Liz Morris (Service Receptionist) & her Husband John on the birth of their son Jack who was born on Friday 28th March weighing 8 pound 2 ounzes. All the best to the proud new parents!